UKIP: a party of the dispossessed taking votes from Labour? Three years ago, to coincide with the aftermath of the 2010 general election, Matthew Goodwin published a book setting out to explain what he predicted would be (in the book’s subtitle), the “Rise of the British National Party”. The book combined a narrow, institutional history of the internal clashes which had produced the BNP’s then leadership, with an televisual style of interviewing in which Nick Griffin et al were asked a series of open questions and given every opportunity to present their view of the world. Finally, a series of opinion polls were used to test the social base of BNP voting and bolster the book’s analysis of that party’s rosy electoral future. In 2014, Matthew Gooodwin (with the assistance of Rob Ford) has published a strikingly similar book. It follows the same method as its predecessor and reaches similar conclusions. This book is rather more compelling (2010 was after all a rout for the BNP) for the fortunate reason that at some stage in the project’s genesis, the interest in the BNP has been scored through and replaced with UKIP. A large portion of the book is devoted to an institutional history of UKIP. This material is made valuable by the relative absence of previous studies to which it can be compared. In acknowledging the existence of Nick Griffin, Goodwin’s last book was treading very well-trod ground, by contrast there have been fewer previous studies of UKIP. That does not mean there have been none – Amazon supplies at least three previous institutional biographies of UKIP, by Mark Daniel, Bill Etheridge, Peter Gardener, none of which are acknowledged in Goodwin and Ford’s book. Yet none of these earlier accounts are well known. This time, at last, the authors have successfully identified a relative gap in the market. Being the first there does not mean that the account is authoritative. Every dozen pages or so, there is an error or a significant omission which sticks in the memory and causes you to doubt the judgment of the writers. When UKIP was launched in 1993 Alan Sked, UKIP’s founder, had a more interesting political past than just having stood as a Liberal candidate (page 21). He had indeed stood for the Liberals, but that was once, 23 years previously. In 1993, he was a Thatcherite of several years standing. The pre-UKIP Sked was an economic liberal (i.e. a neoliberal) and a social libertarian, and the early UKIP well reflected its founder’s enthusiasm for the interests of business. Nick Griffin was not a young member of the BNP in 1993 (page 54). He was neither in the BNP nor especially young, having already spent over a decade in the leadership of the NF and its splinters. The Race Relations Amendment Act, passed in response to the Stephen Lawrence campaign, required public authorities to take steps to prevent race discrimination. It did not make “religious prejudice a crime” (page 132). Equally annoying is the passage on the same page where Goodwin actually auto plagiarises from page 56 of his last book the fantasy that the Labour government of the early 2000s “liberalised” immigration policy. In thirteen years of government, Labour passed six major immigration statutes, innumerable statutory instruments and several hundred changes to the immigration rules; almost every single one of which made the law more restrictive. As with his book on the BNP, Goodwin suffers from a serial absence of scepticism in repeating when he should be questioning the stories that the right likes to tell about itself and the world. The biggest problem with this part of the book is that UKIP is never placed in any meaningful context, whether in terms of the interests of the various funders who have switched from the Tories to UKIP, or in terms of the press that sensed an opening to the Tories’ right and have actively promoted UKIP since 2010, whether out of a dislike of the Coalition or revenge for Leveson. UKIP is an anti-European party which has until recently polled much better in European rather than domestic elections, there is no engagement with why millions of voters might have disengaged with the European project and be willing to vote for the most anti-European option available to them. The Tories, the war on terror, the dismantling of the welfare state and the refocussing of the state on the interest of business – are all placed somewhere in the background, none in any compelling relationship to UKIP. Rotherham, which should provide a vivid example of UKIP’s ability to exploit racialised fantasies about male sexual violence, gets just a single paragraph. 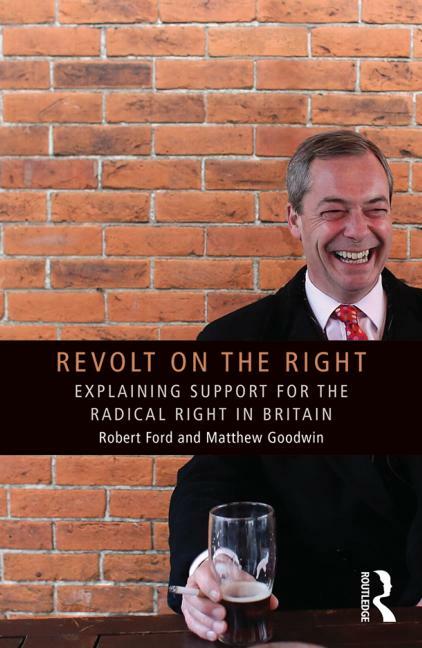 The second major component of the book is an attempt to characterise UKIP’s voting base, which Ford and Goodwin, again drawing on Goodwin’s past in fascism studies, compares to that of the French FN or the BNP. UKIP is portrayed as a party of the dispossessed which prospers principally from New Labour’s strategic decision to put more effort into recruiting young, socially liberal, urban voters and its relative lack of interest in working-class voters who had no option but to stick with Labour. This narrative is buttressed by an impressive array of statistical charts. It is however flawed. One wrong assumption is that working-class voters historically had a party with which the vast majority of them identified – ie the Labour Party – until, at some recent point in the past, Labour stopped representing them. The mistake here is to assume that Labour has always had a clear majority of working class supporters, and that it has lost touch with its base only as a result of Blairism. The more complex truth is that at every election in British history there have been large minorities and usually absolute majorities of working class voters who have voted against Labour. Liverpool is often held up as the most anti-Tory city in Britain; its Wavertree constituency had Conservative MPs until 1983. South Sunderland had a Tory MP until 1964. A plethora of older analyses tried to explain the resilience of working-class Tory voting in terms of attachment to Unionism (important in Liverpool, Birmingham and Western Scotland), white-collar Toryism, deferential voting, etc. Maybe at some point in the future, writers will grasp that what brought millions of voters to Labour was not class position (as if people’s class was something static, which their politics would simply reflect) but class experience so that for example Labour voting has always been dramatically higher among trade union representatives than it has been among trade union members. The data the authors use as a proxy for class derives from the Goldthorpe-Heath class schema, which divides up members of the public according to the skills associated with the job they do: so nurses, as professionals, are near the top, while someone who owned their own business is plumb in the middle of the ladder. To try to write a sociology of how people vote which takes into account their education but not their income or capital leads to a wholly distorted picture. Even if we accept Goodwin and Ford’s sociological analysis that UKIP voters left education at a younger age than non-UKIP voters, and are more likely to have worked in manual jobs, voters are not switching to UKIP in equal numbers from Labour and the Conservatives. At page 166 of their book, the authors suggest that among people who switched to UKIP between 2010 and 2013, former Conservative voters outnumbered former Labour voters by a staggering seven to one. This fact alone drives a cart and several horses through Ford and Goodwin’s portrayal of UKIP as an equal threat to the Tories and Labour. A further weakness is the lack of any serious attempt to map the intersection of class and age. If UKIP’s recruits are mainly of retirement age then the voters who have switched to UKIP since 2010 overlap with the generation who benefited from right to buy in the mid-1980s and who delivered the Tories their election victories in 1987 and 1992. Their formal education may have finished early, but home ownership provided several hundreds of thousands of people with a sum of capital which has been equivalent to decades in the workplace. To present such people as “disadvantaged” is to assume that a person born in 1950 who left school at 16 will have less income and a worse life than their younger counterpart who left education at 18 or 21 in 1990. But the older group will have – over their lifetime – more disposable income, a larger home, greater security in their house and their job and a better pension. Goodwin and Ford illustrate their view of the UKIP demographic with the example of John, a hypothetical construct, who worked in a factory all his life, and always voted Tory (really; why – surely someone with that work history be much more likely to be a non-voter? ), but switched to Labour in around 2000 on being made redundant at 50. He is now 64, has not worked in years, and has no prospects; voting UKIP enables him to kick against everyone. No doubt there are some Johns out there. But they are not the whole or the largest part of that political generation. Two further biographies might get you closer to the sociology of UKIP switchers. Imagine John has two cousins, Paul and Maureen. Paul worked in the Post Office in outer London till the mid-1980s, always voting Labour. He was made redundant as were many of the people he worked with but rather than just feel sorry for himself, he used his redundancy money to buy his council house. By the end of the decade he had three houses, two of them paying enough rent to cover the mortgages. Later, he took different office jobs without ever settling down. He tells friends they are his “hobbies”; it is his income as a landlord which keeps him afloat. The third house he sold ten years ago just before the recession hit. Successive moves have taken him away from London; his jobs will earn him almost no pension at all, and he is relying on selling the second house to tide him through retirement. The tax bill alone will be in six figures but his profit on the sale will be larger still; and between the state pension and his savings he will be on the same absolute income as twenty years ago – even if with inflation it will feel like a small, and shrinking, allowance. Paul voted Tory between 1992 and 2010 but dislikes Cameron and promises to never vote Tory again. Maureen also grew up in a city, in her case Manchester. She left school, as all three did, at 16, and then worked in nursing. If she made it in the public sector, then her headline salary would now be double Paul’s, but this is misleading since she has had to cut her hours to care for her two elderly parents. If she is in the private sector then she will be on a zero hours contract and the minimum wage and working every shift she can – her salary will be half Paul’s – and someone else will have to cover her family’s emotional and physical needs. She has mainly voted Labour but never really identified with the party, and switched at times to the Liberal Democrats and even once or twice (although she does not like to admit it) to the Tories. She lives in a council flat. Unlike Paul, she has a pension. But on retirement her disposable income will fall by three-quarters. She has no savings, and is not looking forward to the future. An implied message of Ford and Goodwin’s book – although this is never adequately explained – is that immigration has supplanted anti-European sentiment as UKIP’s key policy and that this shift has accompanied UKIP’s break from tradition after this year’s European elections (it had secured high votes in the 2009 and 2004 elections but then subsided in the polls, this time it has held its ground). My sense is that there are hundreds of thousands of voters who have switched to UKIP principally because of its anti-immigrant message, and for whom race acts as an organising belief: it structures their nostalgia for their childhood, and their resentment at a world which offers declining opportunities to them. But among this group, a number of years spent campaigning against the BNP – in London, Sunderland, and elsewhere – makes me that think there are many more Pauls switching to UKIP than there are Maureens or Johns (the Maureens of the world are noticeably a core demographic of many anti-racist campaigns). Ukip identifiers are people who grew up in working class families but who found that the politics of the 1980s offered them certain opportunities to accumulate savings and advance socially compared to the people around them. Rather than being grateful to the politicians who tried to split the working class (and even to some extent succeeded) this generation attributes its relative success to its members personal attributes (hard work, intelligence) which it finds missing in the younger generation. From a position of relative (but not absolute) security, this layer feels intense feelings of resentment at those who are “milking the system” – the single mothers you can read about in the Express with their football team-sized families, the asylum seekers living in their imaginary mansions – and somehow catching up with them. The fear of immigration shown by Farage’s newer admirers it follows is not a revolt of the most dispossessed but the resentment of people who believe they have something to lose, and are determined to keep ahead. I may be wrong. This is the reason why people do research, in order to challenge their own assumptions (and, in this case, the stories that parties put out about themselves). But little in Ford or Goodwin’s sociology would enable you to predict which of Paul, John or Maureen would be the more likely future UKIP voter. In terms of the figures on which they focus, Paul, John and Maureen are near identical – white, fast approaching retirement, after having left formal education early. If Ford and Goodwin were asking better questions, we would all have a clearer sense of which groups in Britain have been moving UKIP’s way. David, I’d accept that Goldthorpe is in principle nominal, but it becomes hierarchical at the moment when people use it as a measure of class (as Ford and Goodwin do, as of course do our media, repeatedly). At that point, people use 1-3 as a shorthhand for middle class, 4 as shorthand for self-employed, and 5 and below as a shorthand for working class. But if you use the criteria in that way, then you are placing employees with university qualifications “higher” than business owners, which is not how I understand class, in which relations of management or control are principal. If you take the example of “Maureen” I use in my article, as a nurse, she would fit into category 2 (see eg here http://www.ons.gov.uk/ons/rel/health-ineq/health-inequalities/patterns-of-social-mobility-by-ns-sec/prt-2.xls), ie non working class. Except that she is most likely to live in working class areas will do a recognisably working-class job, etc.